A Detailed Guide To Safely Root Any Android Mobile Without PC or Laptop Using Various One Click Root Tools: Android smartphones have evolved a lot over the years and most smartphones these days come with a lot of useful additional features that were only available on rooted smartphones a few years ago. So, basically, most things you did by rooting your phone could now be done by simply downloading an app or changing a default setting on your device. However, there is one thing which still cannot be achieved without rooting your phone, installing custom ROMs or unofficially updating your device to a newer Android version. Most smartphone manufacturers only send one major software update to their smartphones after the release. While most people replace their old phones with a new phone within a year or two, for people who tend to use their devices for more than 2 years the situation does not seem favourable. So, if you want to install a newer version of Android on your device even though your phone manufacturer does not release it officially, the only way you could achieve it is by rooting your Android device. But, the most rooting method requires you to have a PC or a laptop to proceed and this might not be ideal for someone. 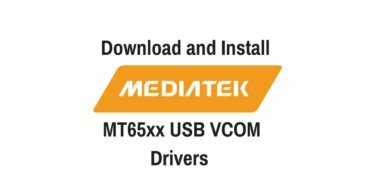 Some people might have obsolete computers with no support to USB drivers or ADB files or some might have slower computers that are not capable of running these tasks. So, if you want to root your device safely and quickly and without using a computer, here is how to do it. But remember, rooting will void your warranty, so if you don’t have any warranty left or if you don’t really care about it, proceed. Important: Most of the One Click Root Tool doesn’t work with the latest Version of Android. Once these tools get new updates we will update the links.So keep visiting. Farmaroot is an app that is created by developers over at XDA forums and it is made available for download only by members of XDA. This app is currently one of the best and safest solutions to root your Android phone without PC and with one click. You can download the latest version of Farmaroot APK file from the below link and then install it on your device. If this is the first time you are installing an APK file on your Android phone, you have to first enable unknown sources from the settings. To do this, go to Settings->Security->Unknown sources and then enable it. Now open the downloaded file and install it. Once the installation is complete, just open the app and then Select the Install Superuser option and wait till a successfully rooted message appears. Universal AndRoot is a perfect option if you just want to root your Android phone temporarily. You might want try out a custom ROM, patch an app or simply need it to access some system files. 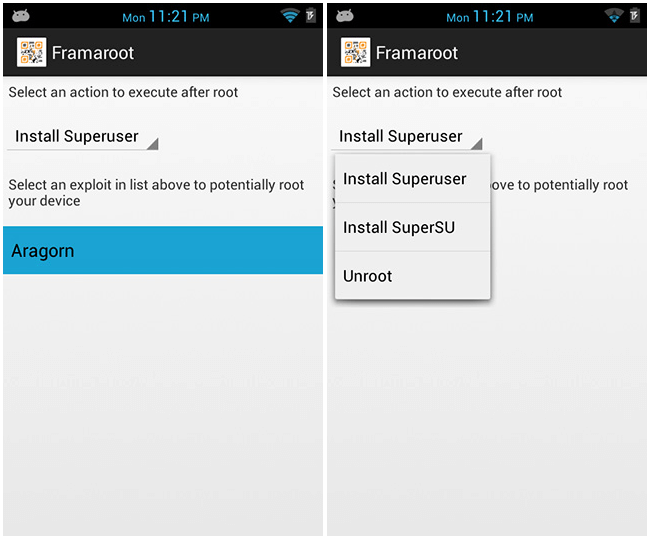 If that is the case, you can try rooting your device using the soft root option in the Universal AndRoot app. To do that, you have to first download and install the app on your device from the below link using the method mentioned above. Once the app is installed on your device, open it from the app drawer. Now you have to select the Android version currently running on your device from the drop-down menu at the top and then select the root button at the bottom. Once the process is complete, reboot your phone and your device will be successfully rooted. Baidu root app is based on China and unlike other one click root apps, it comes with a few extra features that are very useful right after you root your device. For instance, its cleaning engine will automatically detect and remove any pre-installed bloatware or unnecessary apps on your device. It also comes with permission control which would deny malicious or suspicious permissions from apps. To root your Android phone running Android 2.3.2 Gingerbread and above, first download the Baidu APK file from the below link. Now install the APK file on your device using the above-mentioned method and then open the app. Now simply click on the root button on the app and wait till the process is successfully completed. Now reboot your device and it will be rooted once the boot process is completed. 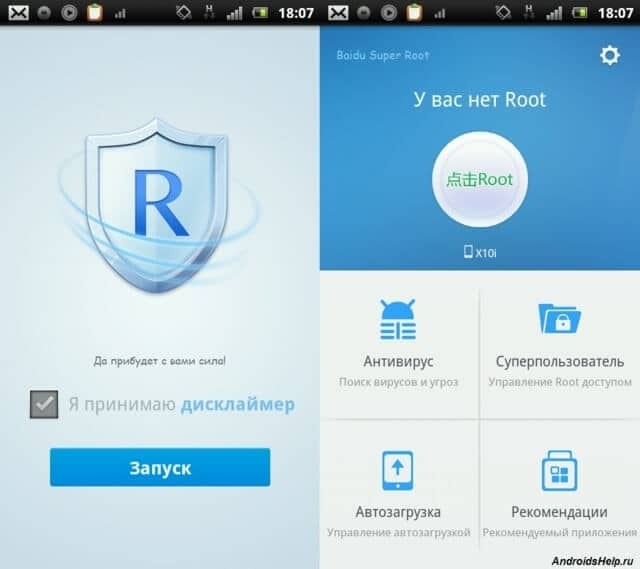 Similar to the Universal AndRoot app, TowelRoot also supports soft root method which means you can use it to temporarily root your device and the root access will be removed once you reboot your device. 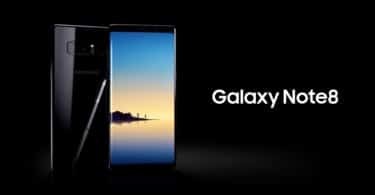 If you own a Samsung Galaxy device, then TowelRoot might be the ideal choice for you to root your device as it is designed to be more compatible with Samsung devices but it also works well with most popular flagship and mid range Android smartphones. 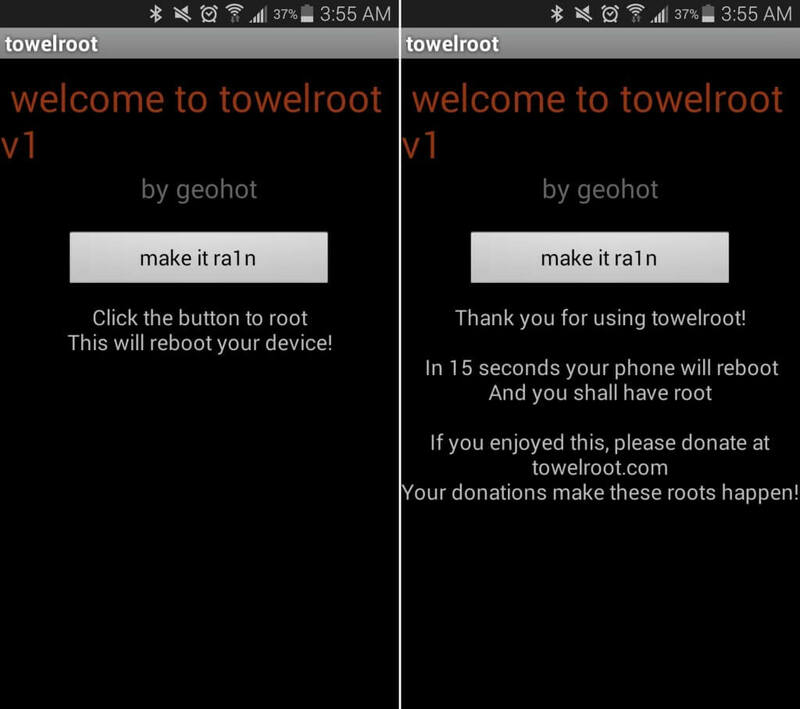 If you want to use TowelRoot to root your device, you can download the APK file from the below link and install it on your device. Once the installation is complete, open the app and then click on the make it rain button. The root process will now begin and your device will automatically reboot once the process is complete. 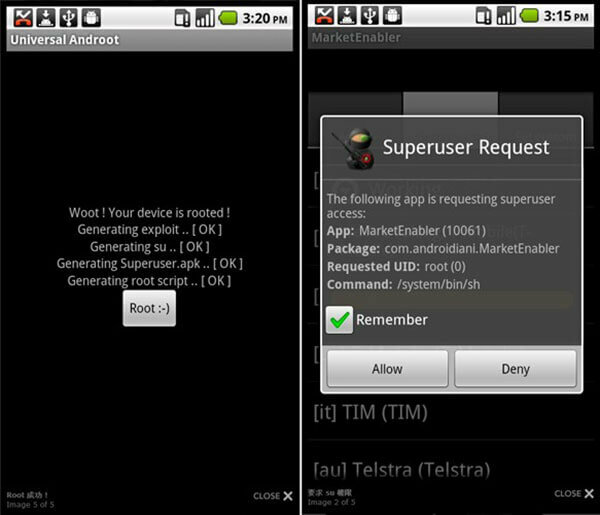 Upon reboot, you can now use the SuperSU app installed to grant root permissions to your apps. 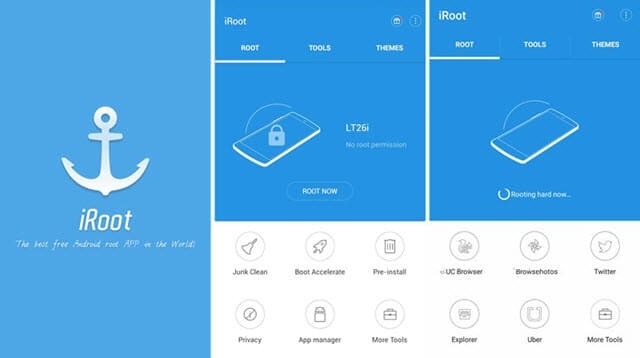 iRoot is the cleanest and sophisticated one click root app in this list and anyone can use it to easily and safely root their Android phone without any hassle. Its simple user interface is less confusing than the other apps on this list and it also comes with a few extra useful features. You can download and install the iRoot app on your device by downloading the APK file from below. Once the app is successfully installed on your device, just open the app from the app drawer and then select the root option to begin the process. The app will now install the root permissions and the SuperSU app automatically on your device and upon the process completion, you can reboot your device to make sure everything works without any issue.